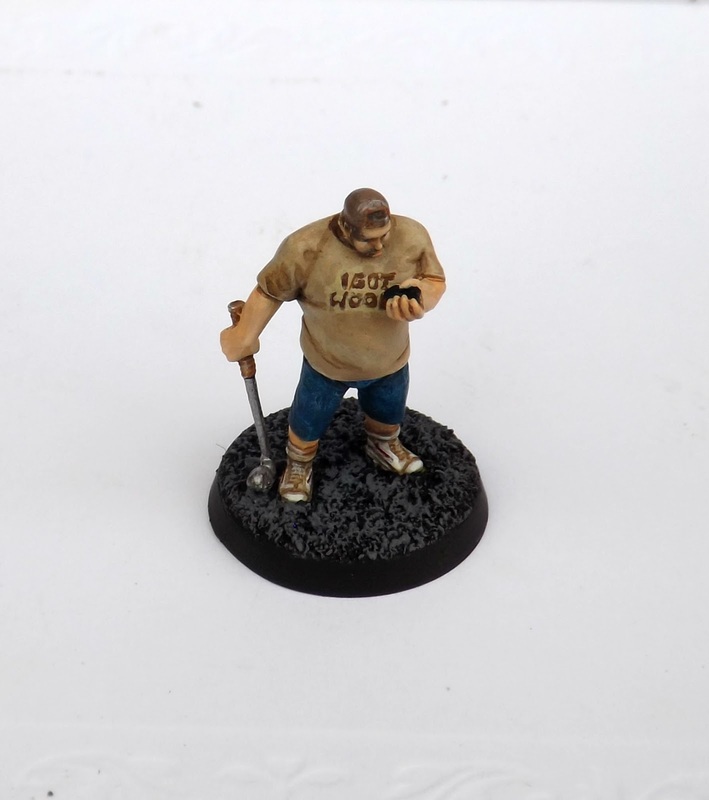 The Berks have survived a few games now, and are becoming a little more effective at what they do. Last game I rolled two 'Specialist' skills which enabled a ganger and a juve to take special weapons, so I gave them both a flamer for use in Dan's next mutie hunting scenario. The Space Marine conversion represents Dhecker in his mesh armour, with new power axe and bolt pistol. He received an eye injury last game, hence the eyepatch head. 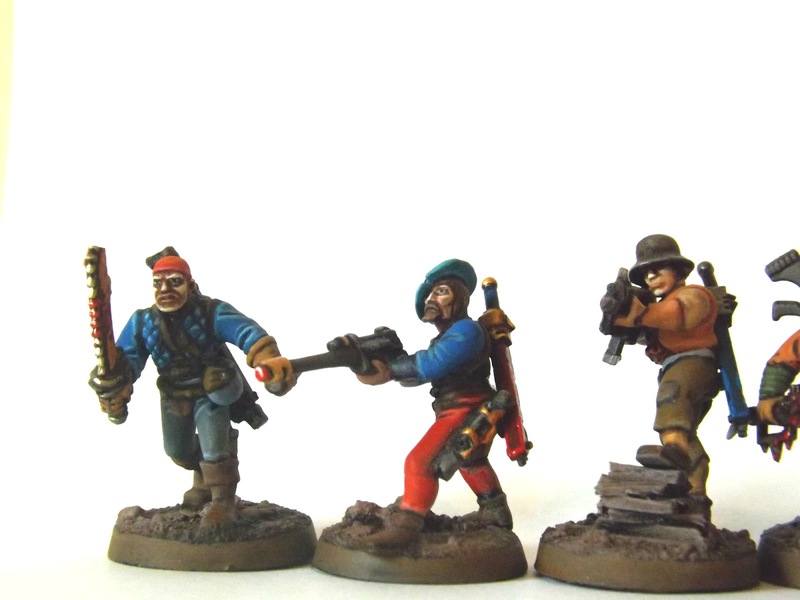 A Mordheim gang for a now lapsed campaign. They're a combination of classic old Chaos Warrior figures and converted Marauder Orx from Mantic, mixed up with old plastic Chaos Warrior bits. The one on the far right was a recast of another figure using oyumaru. 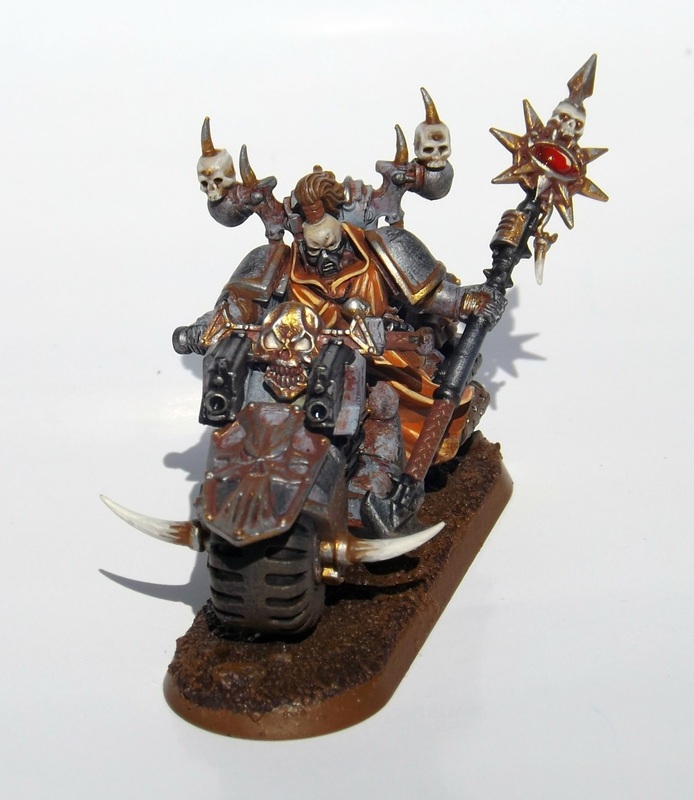 The gang used the rules for the Chaos Beastmen, and had a minotaur with them. 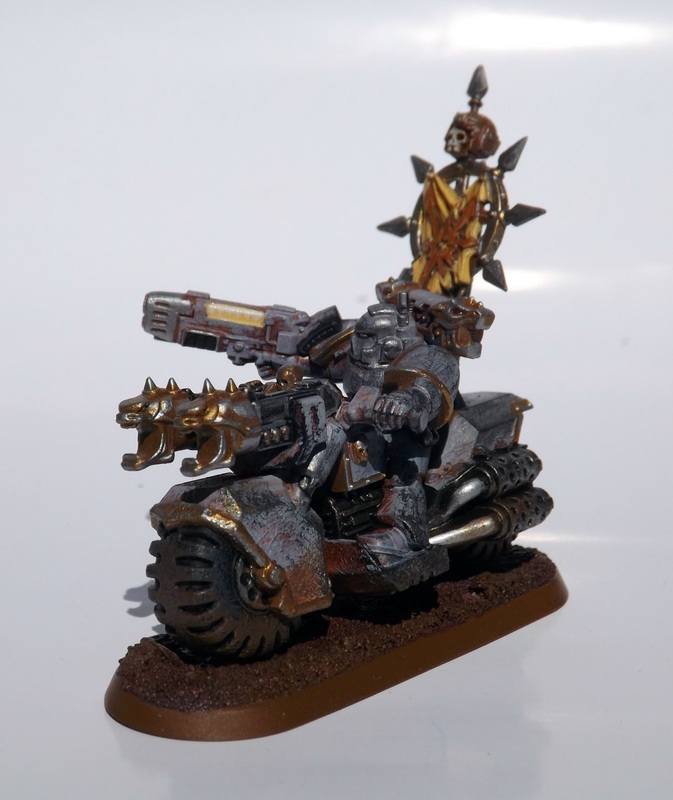 They were quite fun to put together, but lacked any kind of missile weapons so were pretty limited in how they played. 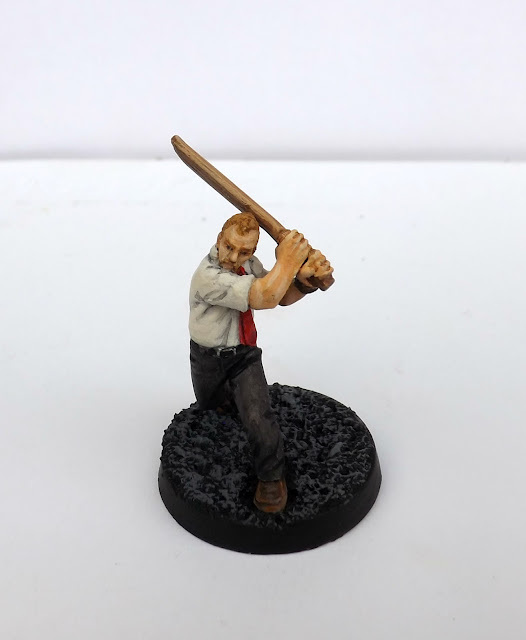 WIP for an Enforcer captain, for our Necromunda Capaign at Dreamdealers. Managed to grab a gang of them for £20 at the UK Games Expo in Birmingham this year, and thought I'd grab the bargain before they're only ever on ebay for silly money. 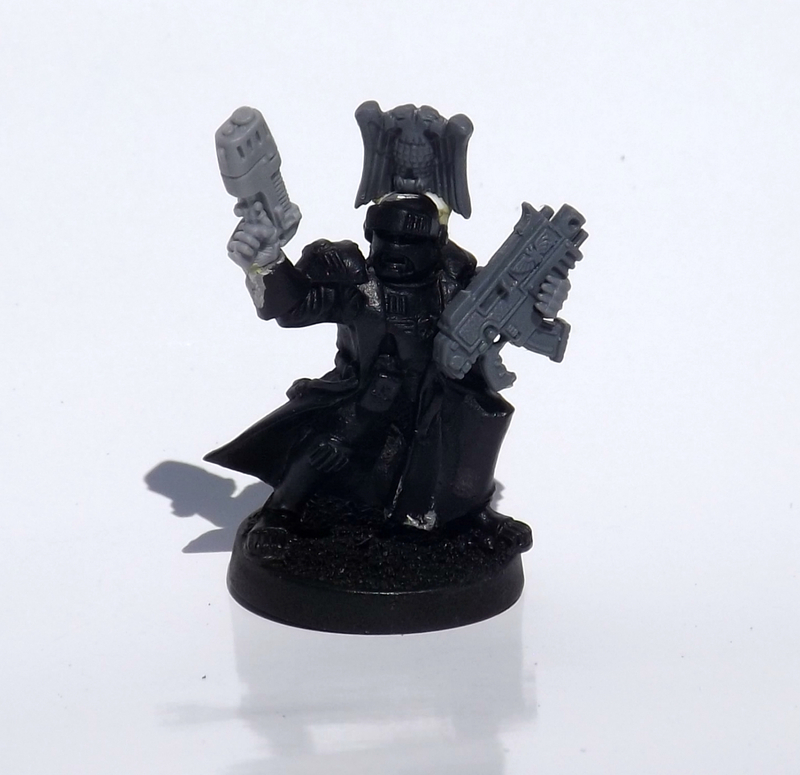 Kitted him out with a plasma pistol and bolter. He's probably going to be widely hated. Shot of Unit 1; made from a combination of the old plastic fantasy Chaos Warriors and Chaos marines. I painted them with a mix of colours so the group would fit better with Unit 2. 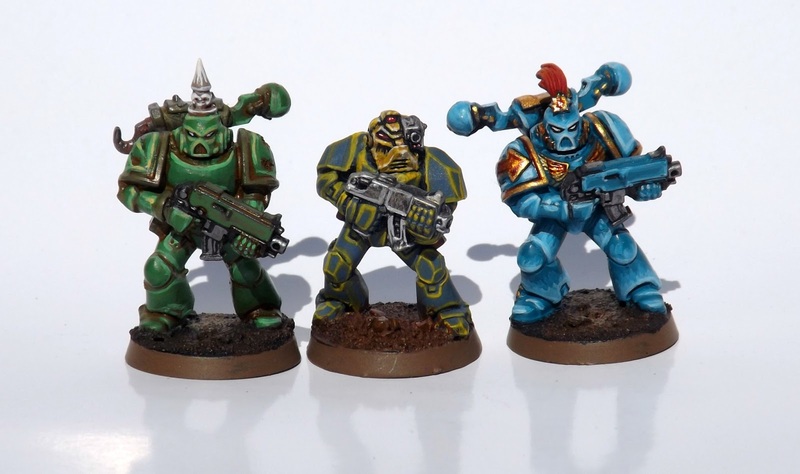 Shot of Unit 2; All of these marines are converted loyalists, including the champion, whos just had a head and torso swap. 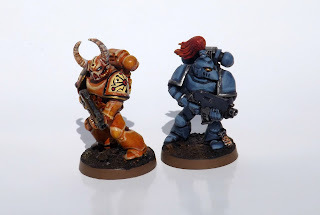 After painting 5 marines white and getting tired of it, I decided to indulge, and used paint from just about every pot I own. All too often I've bought an interesting, bizarre colour only to find it months later unusable in the pot (which is why I'm moving over to vallejo paints). With a totally mixed up paint scheme the marines go quite nicely with the pirates I converted up for use as cultists, and in my head, I think of them all as renegades and deserters from chapters and warbands, each with their own story. The guy in the middle's been bouncing around on his own for years and finally has some mates. Filing off all of the iconography was a bit of a pain. 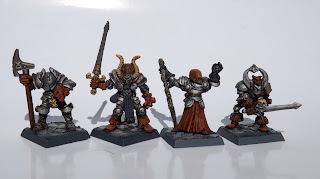 Some of the heads are straight swaps for chaos marine heads, and some of them are the original heads (securely fastened as part of the single piece figure), where it was simpler to just glue on some horns. 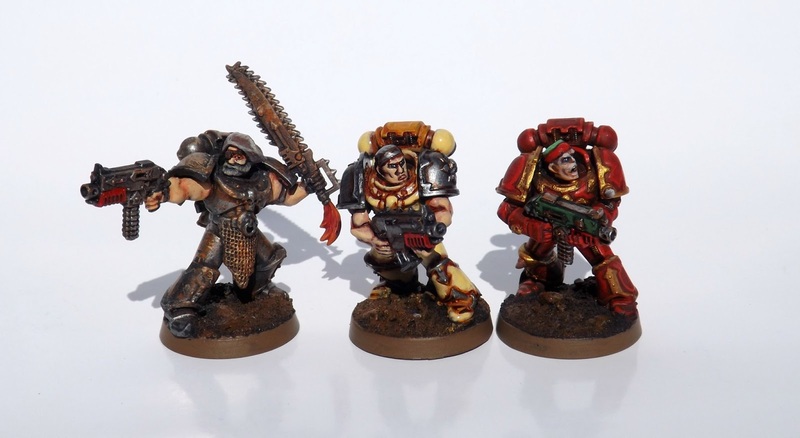 Catachan parts made these marines look more like renegades. Slowly, slowly, I am beginning to get things finished. 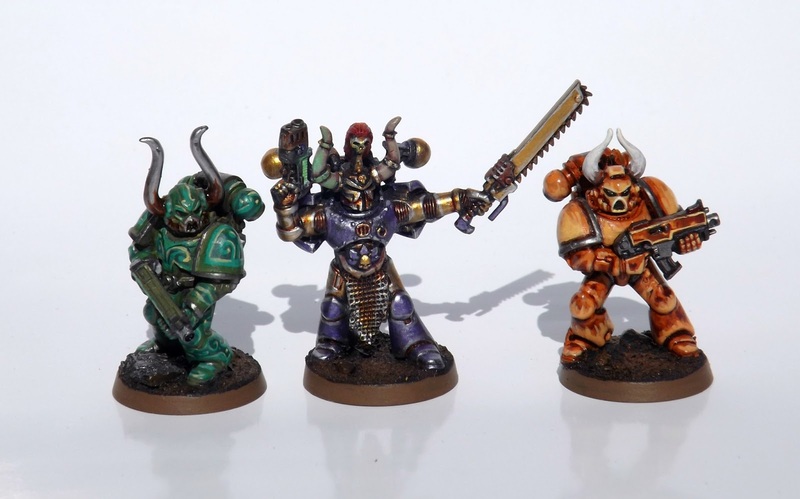 However, I've recently got a job abroad, so I probably will have only about 10 weeks before having to put most of my miniatures in storage for a year or two. What I am not going to do is sell everything, all this stuff took me too long to put together and paint! 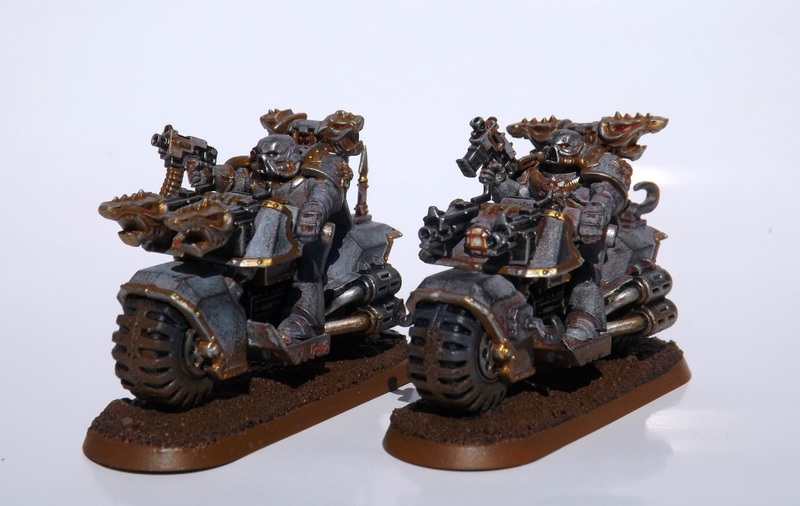 The Bikers are based on the three Dark Vengeance Bikers, and three regular Space Marine Bikers. 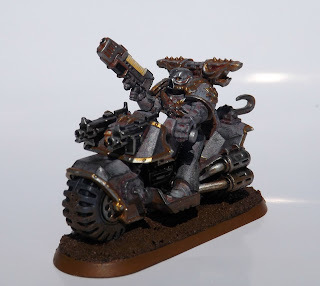 No Chaos Bikers have actually been used, which I like, because it makes them look a bit different. 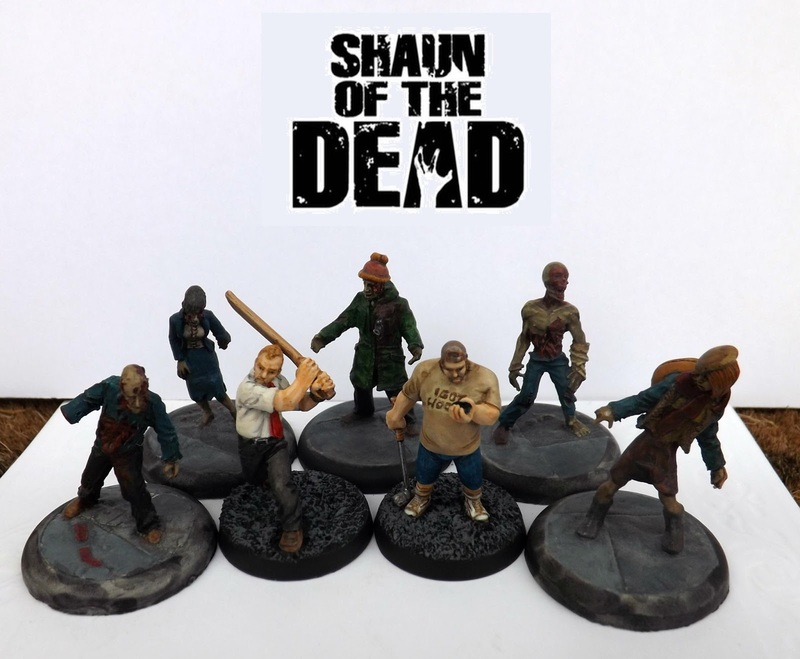 Although I have run them as a Nurgle list lately (mainly because I wanted to try Plague Zombies), I have tried to keep the models looking unaligned to any one ruinous power. 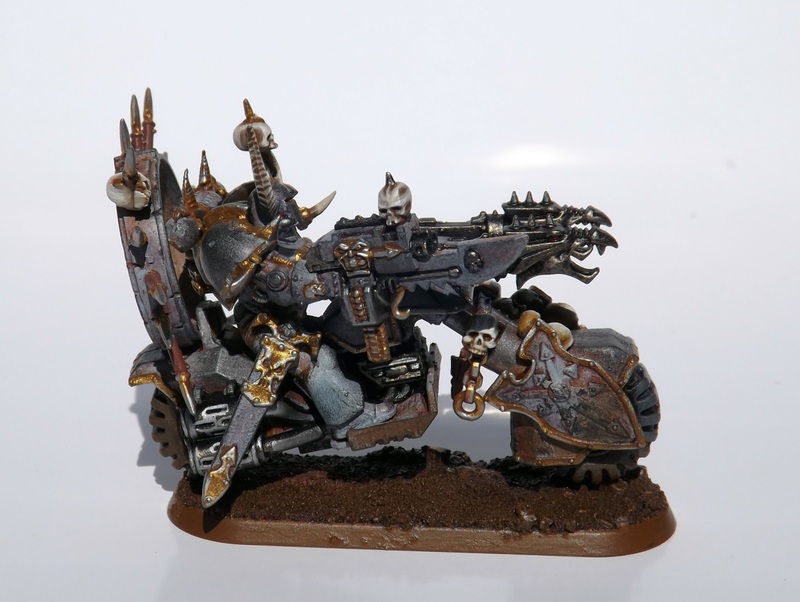 Two of the bikers have magnetised arms to give the option of a bolt pistol or a special weapon. 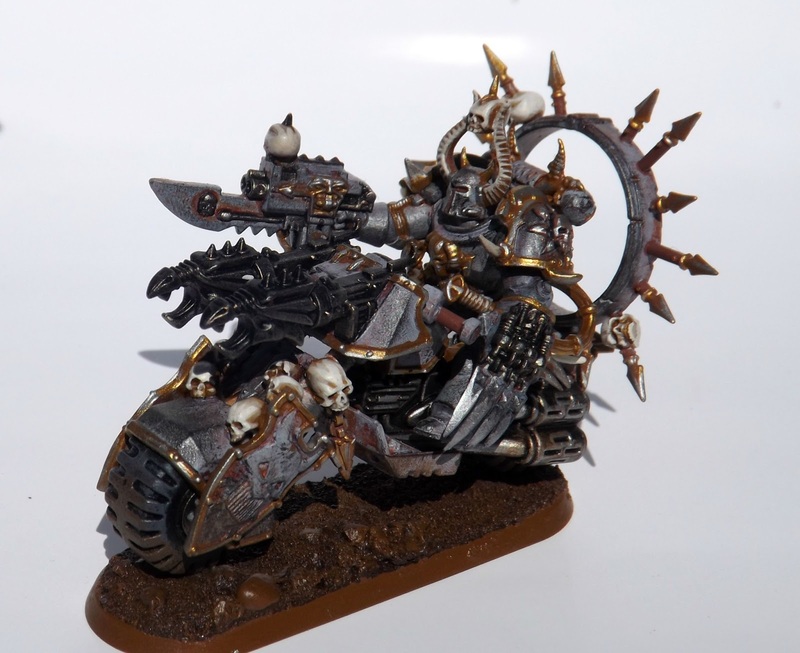 The Dark Vengeance Bikers, obviously, look the least chaosified. 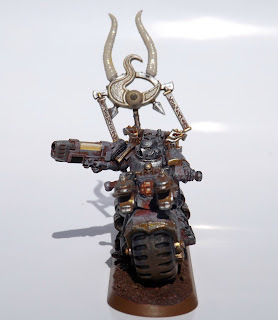 I left some of the feather-designed pole on the back of the bike, and use them to display icons. 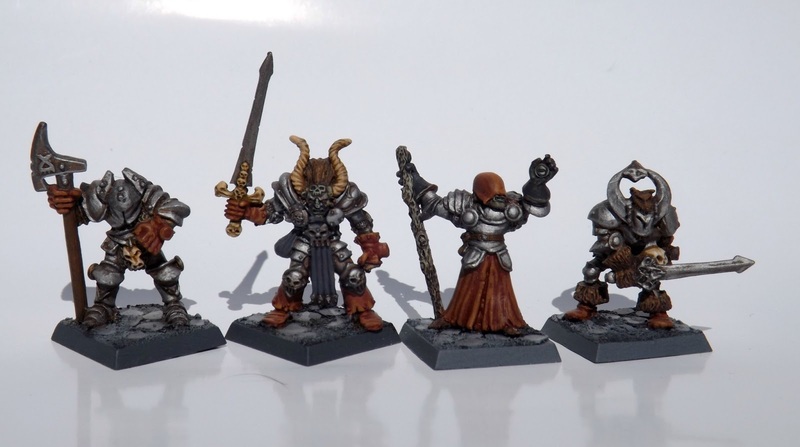 I painted one of each power, and just switch between them depending on which one I want for a game. 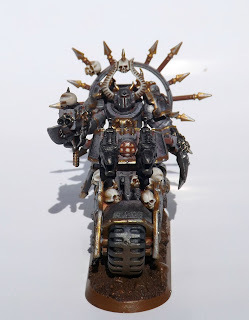 The Biker Lord is magnetised, the pauldrons can come off if necessary. 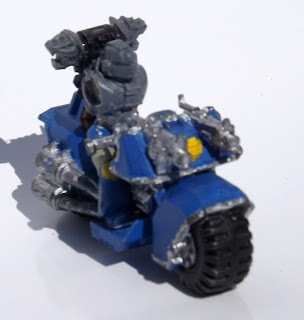 Bits are from various chaos sprues jazz up the otherwise regular loyalist bike. I used some styrene tubing to extend the fork. After seeing Legopirate's own Dark Vengeance Biker's monitors I had a go too. I painted the monitors with gloss varnish afterwards to give them a more reflective surface. The Chaos Biker Sorceror. 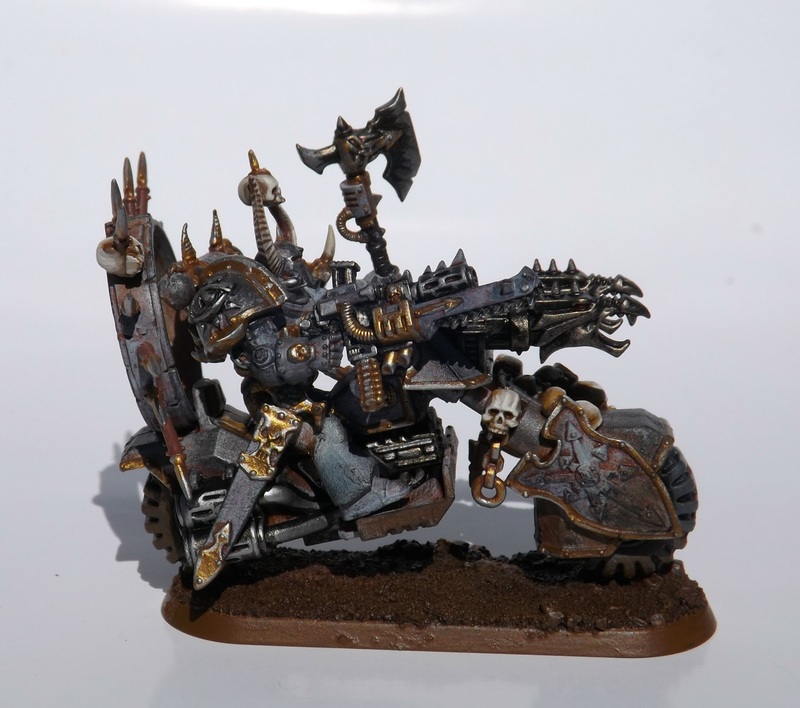 He is based on the Dark Vengeance biker captain. 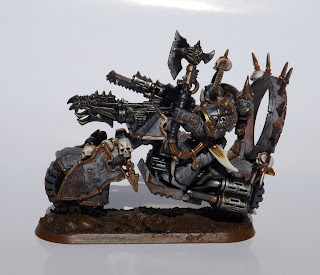 The staff is from the Chaos Terminator Lord sprue, and the shield and skull front piece was a battle standard for the old multi part Fantasy Chaos Warriors. I gave the staff's gem a dab of gloss varnish like the bike monitors. So, after all this time I'd finally got these bikers finished, then it occurred to me that the unit doesn't really have a suitable 'champion' to lead them and take the challenges the Lord doesn't want to accept. So, I'll be working on this donation from a friend to be the unit's champion. His name will be Merlot, and he will be an Ultramarine traitor. But for now he's mostly 'armless. Sontaron (Sharclon Heresy miniatures) painted up! 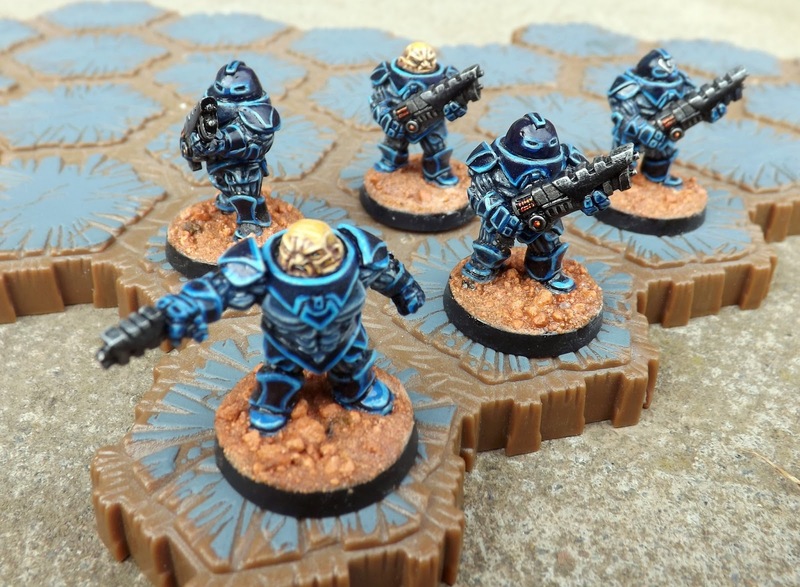 Just had a blast painting these Sharclons from Heresy miniatures; thanks Pockets! They were lovely to paint, especially the faces. 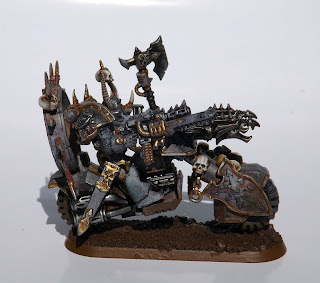 After spending such a long time on my rough and worn Chaos Bikers, it was a pleasure to try something clean and well maintained. Since seeing Dan's Necrons a few months ago with their high-contrast highlight scheme, I've wanted to try something similar. It takes a deceptively long amount of time to do, but I'm pleased with the 'Tron' effect in the end. When it came to basing them I brought out something special I'd been saving, and used some sand I collected from Death Valley near Las Vegas about 7 years ago. 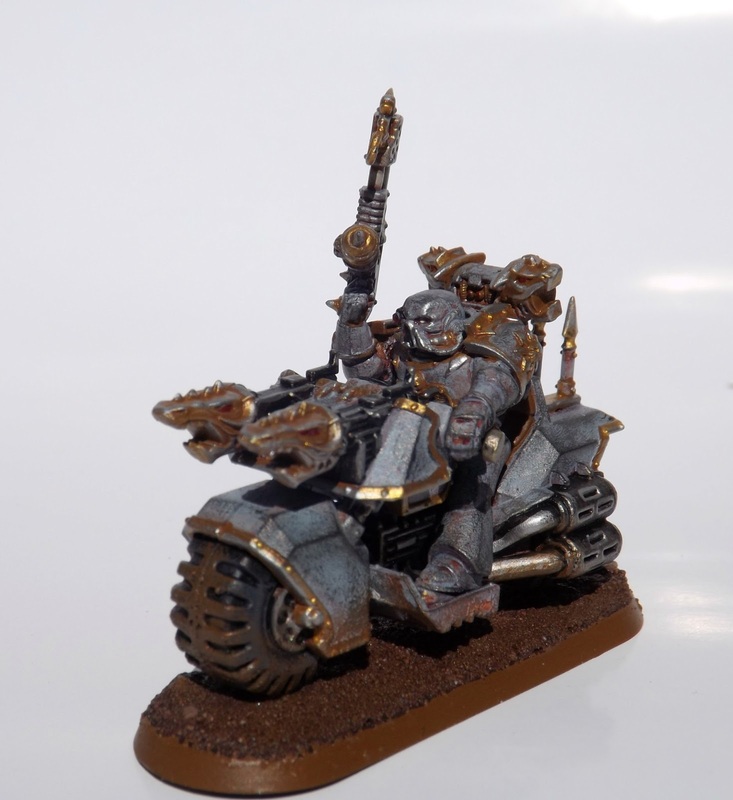 For the bikers I've abandoned attempts at making the marines look unaligned. Unlike the conversions I made out of the oop Chaos Warriors here, I found that simply removing iconography wasn't enough to make them look 'different' to loyalists. What's more, I've recived some generous donations of bits from legopirate at Dreamdealers, and thought it was about time I started putting them to use. 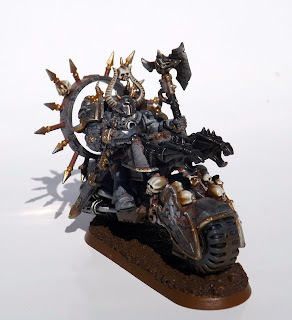 So the bikers will be Chaos... TO THE MAX. 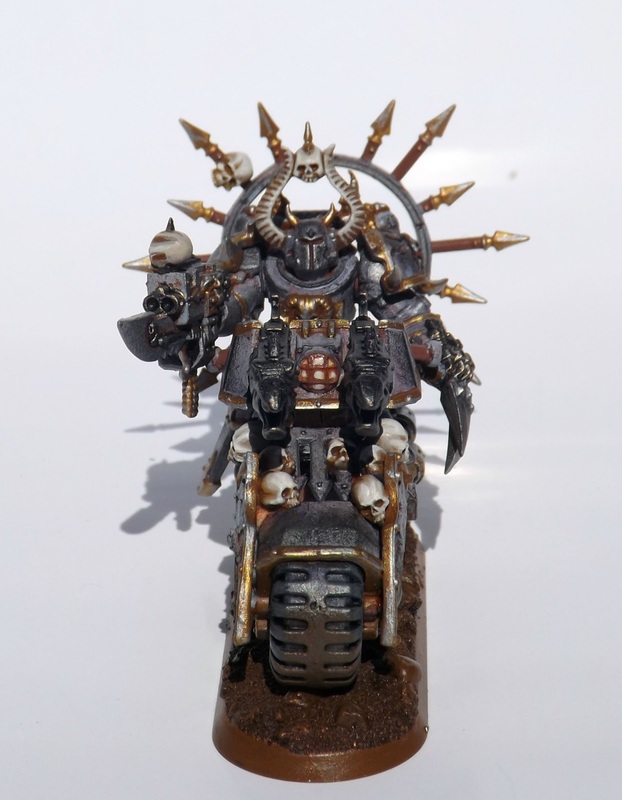 The lord's arms are magnetized, as are most of the biker's, as I really don't know what loadouts will be effective yet. 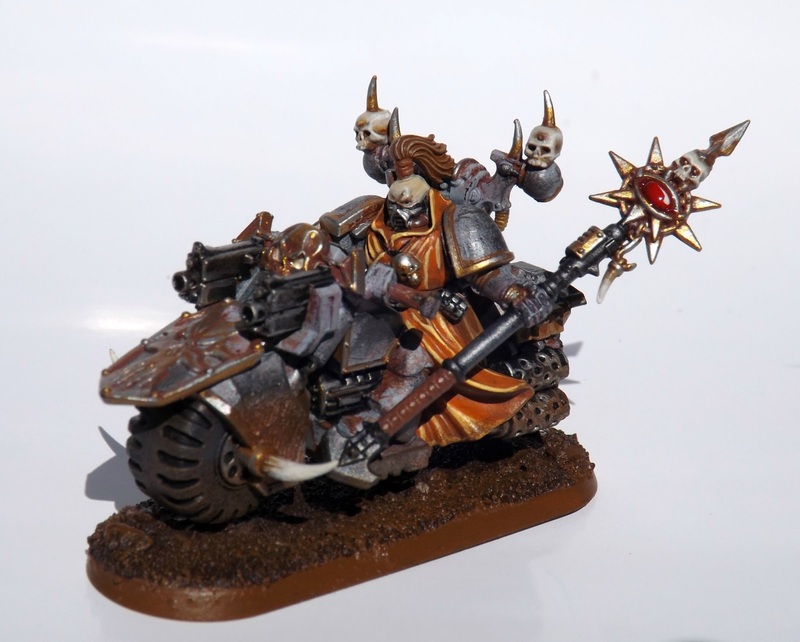 The robed Dark angel biker from the Dark Vengeance set looks enough like a sorceror. I've added a few more bits since taking the picture. My Necromunda gang, the Berks, benefitted from the 'Underdog' rules from the last scenario, earning enough experience to bring their Gang Rating closer to the other players' at Dreamdealers. The ganger's increases overall are taking them toward a more hand-to-hand style of play. I'm not sure how I feel about that. After the game I had the gang blow their entire stash on chainswords. 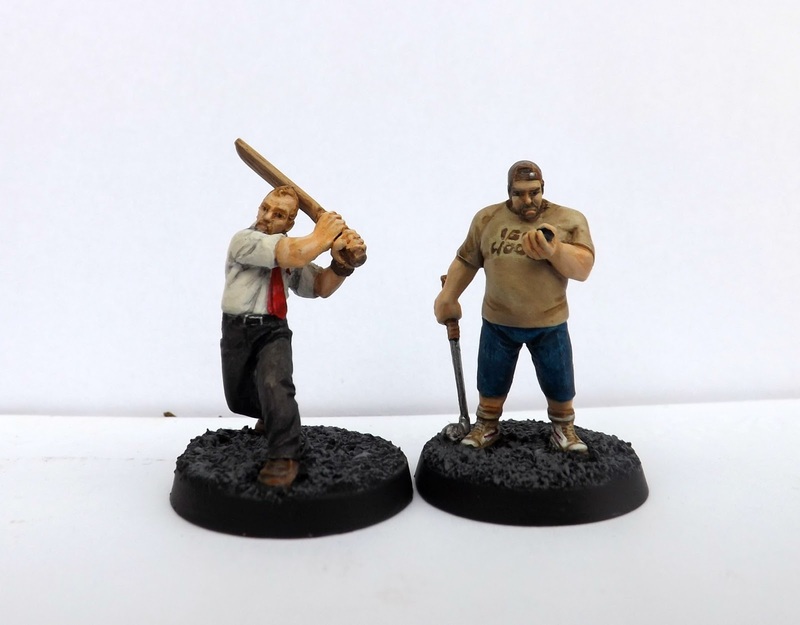 Leader Dhecker's sword has been upgraded to a chainsword, Heinz has a chainsword hanging from his backpack after an enemy Juve got a bit up close and personal last game. All the lasguns now have red lenses at the end of their barrels, and Purple Head's weapon now has an angry purple end. Duke and Smiler (Left) don't have chainswords as they already have Strength 4. By giving them bludgeons (+1 STR), they instead injure at S5. The two Juves on the right have now been promoted to New Gangers, so they can work territories. They were presented with chainswords on graduation. 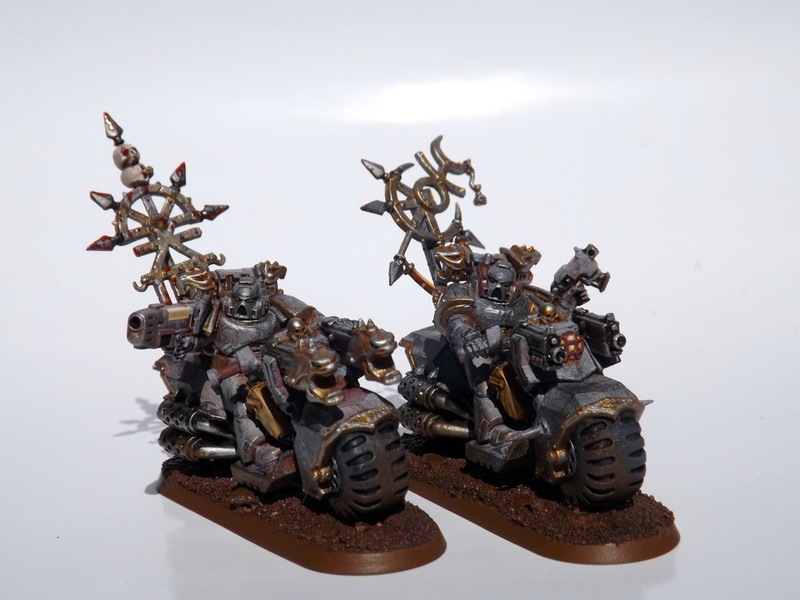 The ganger on the left, Sot, had a mantic orc sword before, but I've changed it to a chainsword to fit the theme. Blood spatters are from a nice shiny gloss paint. Toffy and Squints get chainswords and Toffy's guns have had some gold trim added because it fits with him looking like something of a fop. Bring on a zombie scenario. At Dreamdealer's, TJ wrote a scenario for us to play yesterday, resulting in a massive 5-way gang fight. During you most recent visit to one of your local watering holes, "the lusty ratskin", a drunk old regular shares some interesting information. Rumor has it that an old great former gang leader, hid a secret stash of equipment within your territory. This old hermit just happened to know this location. You used your preffered methods to extract the information you require. Now the race is on to find this secret stash and the treasure it may (or may not) contain. It was great fun, but in retrospect 3 gangs vs 2 makes for a pretty one-sided game. Still, looking forward to the next one. Greensleeves and Goggles, with Smiler the Heavy, surface from the vents that riddle the underhive. The temptation of the nearby stash is resisted as Tannen's Mad Dogs cover the street. The Wilting Violets and the Reapers close ground. The Ceramite Ghosts and the Berks exchange volleys of autogun and lasgun fire from behind burnt-out wreckages. The Delaque Heavy's Heavy Stubber jams as his bullet feed gets tangled up with his packed lunch. Snipers support from high ground. Dan's buildings have removable rooves, allowing us to see the melee inside the building. Hitting on a 7? No problem. This Juve hasn't yet earned the right to wear red overcoat trim. The Berks raid a stash to find a meltabomb and a suit of mesh armour. The Wilting Violets take a detour through the Administratum Office to update their status on FaithBook. Orlock Heavy Stubber giving the Berk's leader a headache. 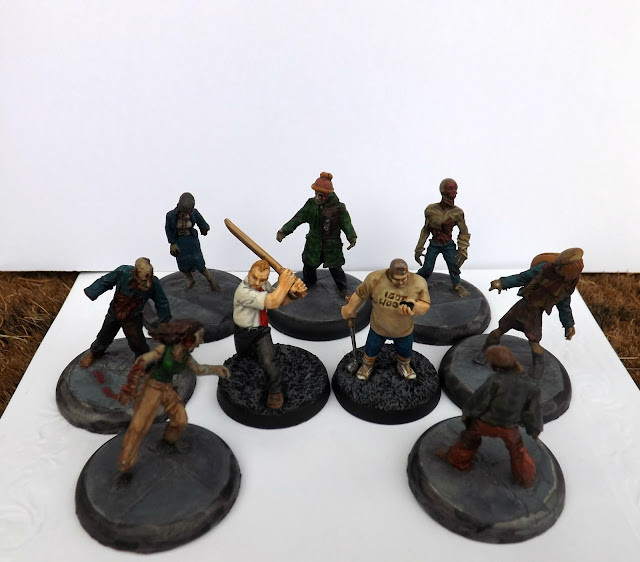 TJ's insane Juve of the Ceramite Ghosts takes on 5 gangers from the Berks, and gives them flesh wounds for their trouble!